A major benefit of electric propulsion is its compactness. Contrary to conventional combustion engines, there are almost no moving parts (except the motor axle and the suspension). As a result, KURT has its motors in its wheels. This frees up a lot of space that can be used for its real purpose, i.e. moving people and goods. In addition, we can make the vehicle much more compact. The latter is a major benefit for cities where space is at a premium. Hence the City-KURT comes in models that are just 80 or 110 cm wide and about 200 cm long. Another benefit of having the motors in the wheels is that the each wheel can be independently controlled. An electric motor might not have a high power rating but it uses it energy efficiently. Maximum torque is available from standstill. 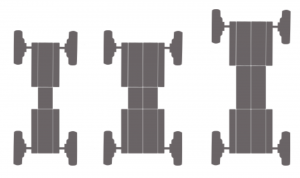 When four traction wheels are used, several 100’s of Nm become available, more than many mainstream conventional cars have. So, heavy loads or steep inclines are not an issue. And last but not least, the vehicle configuration can easily be adapted to the needs. 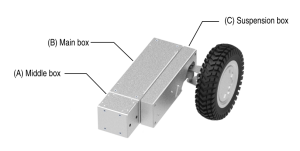 Two front traction wheels might be sufficient for light mission profiles, four wheels with a heavy motor can be used for heavy duty cargo tractors. Another benefit is that safety and manoeuvrability can be enhanced by optimised software control of the wheels. 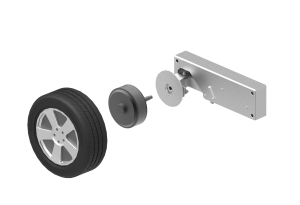 The traction on each wheel can be adapted to reduce slippage and to take corners safer, or counter torque can be applied for emergency braking. Very tight corners can be made by steering the wheels independently from each other. A KURT has many sensors that monitor its dynamic behaviour and these can be used to increase safety.